In most cases, the elderly suffer from motility issues that result from joint problems and weakening muscles due to aging. A transfer pole comes handy as a practical assister for seniors and disabled people allowing them to sit down, rise and most importantly move around. 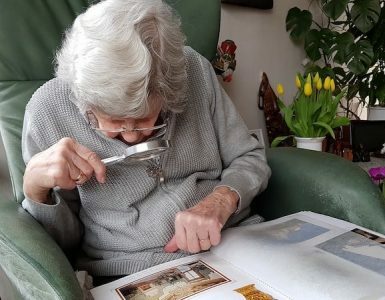 It helps the elderly take control of their lives by giving them a sense of independence, through support. Besides, a security pole for elderly helps prevent unforeseen accidents that can result from the lack of proper support or mobility issues. Maintaining a security pole is easy and improves the overall security of your room. However, choosing the best transfer pole for the elderly can be a challenge due to the number of products available in the market. With proper research and knowledge, it is possible to get the right product that suits your requirements and is within your budget. What is a transfer pole? Why Senior Need Security Pole? A transfer pole is a secure transfer aid bar installed between the floors and ceiling to provide enough support to seniors for a variety of transfer applications. The floor to ceiling pole for elderly is mounted on the floor and ceiling with screws that ensures the transfer aid is securely held. It also features rubber pads on the floor plate and ceiling plate that holds the security pole in place while also preventing marring of the floor or ceiling. 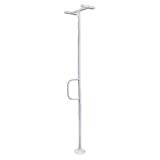 The best transfer pole for the elderly can easily be installed beside a toilet, bath, chair or bed as it is compact. 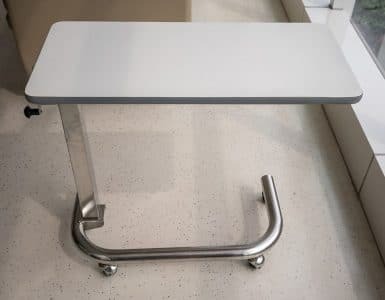 This makes it an ideal transfer aid for seniors for support in small restricted areas such as between wall and bed (you may also need a hydraulic patient lift), narrow hallways and use in areas with limited space such as washrooms. A transfer pole allows for weight shifting, standing, moving, transferring or leaving the bed and transferring into wheelchair, bedside or to a walker. 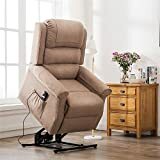 As mentioned above, seniors tend to develop motility issues due to weak joints and muscles, which cause them to lose the ability to transfer independently from wheelchair to their bed or from bathtub to the floor of the bathroom. Security poles are excellent fall prevention tools and thus help prevent falls and near miss cases. This makes them ideal transfer aids especially for seniors with mobility impairments or other medical disabilities. Therefore, installing and maintaining the best transfer pole for elderly adds stability and security to your or beloved senior’s environment. Most floor-to-ceiling poles for the elderly have high weight capacities and are height adjustable, which allows them to suit a wide range of people. Besides, they also feature grab bars for added security and too easy to install. When looking for a security pole, there are many things that you need to put into consideration to ensure that you get the best value for your money. These include the cost and the critical features since the health of your patient depends on the aid. The first factor to consider is whether the height of the transfer pole is adjustable or static. Why do you need to check the status of the security pole? Choosing a transfer pole with adjustable height enables you to keep your pole in an optimum position for you or your loved one to hold on to comfortably. Besides, it also ensures that the security pole fits well into your room’s height for a more solid base. It also makes it easier for you to reduce the height for more easy storage. Usually, transfer poles mainly come unassembled to reduce the overall size for more comfortable transportation. Therefore, it is advisable to check if the security pole that you choose is easy to assemble and if it requires any additional tools or unique skills to join. Considering the weight capacity and grip of the security pole for the elderly helps determine whether the aid can support your patient perfectly. Different transfer poles come with different holding capacity and that the patients’ weight can vary drastically. It is essential to be careful and keen on this feature when finding the right transfer aid. Besides, different poles come with unique gripping designs, and thus it is recommended to pick one that is more ergonomic or ideal for your patient. This is one of the most important factors to look out for when purchasing any product. It is advisable to try to strike a perfect balance between the relatively affordable price and the quality of the product. If you are looking for the best transfer pole for elderly, Stander Pole & Curve Grab Bar is an excellent option for you. The security pole offers a multi-use mounted handle for the bedroom, bathroom or living room. With the tension-mounted design, the transfer aid can quickly be moved around your home without leaving holes or marks. Besides, the transfer pole includes screws that ensure that the pole securely fixed on the ceiling and floor if you intend to install it permanently in your home though it is not necessary. The unique design of the transfer pole ensures that you have a grab bar at the most convenient places such as the middle of the room. Moreover, the main pole separates into two 53-inches pieces, which makes it easy to store or transport. The Stander transfer aid includes a wrench and no other special tools are needed for assembly. Able Life Universal Transfer Aid for elderly is our alternative pick for those who want to upgrade from standard products, but are tight on their budget. The floor to ceiling security pole is a product of Able, which is known for making medical products that add significant value to a patient’s lifestyle. This explains why it is among the most popular security poles for the elderly. 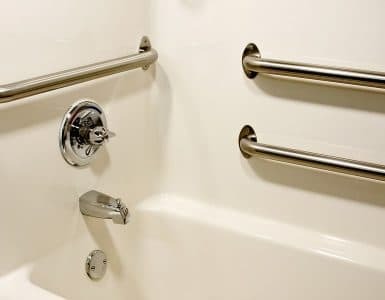 Usually, any person with mobility issues understands that grab bars come handy in his or her home. Unfortunately, grab bars are typically relegated to washroom or bathroom walls. The Able Life universal transfer aid features a unique design that enables you to grab bar anywhere even in the middle to your room or any place in your home. Therefore, buying the Universal Grab Bar ensures that there will be no more drilling, hugging, and no more falls. This is another top quality transfer pole from Stander, which offers grab bar solution anywhere in your home as it can be installed any place. Stander Security Pole allows for secure installation without the use of fasteners, screws or nails due to its tension-mounted design. Therefore, it provides an ideal handle to enable you to get out of bed, getting off the couch or getting out of the shower. Moreover, most customers use the floor to ceiling pole for the elderly to overcome mobility issues, but it has endless creative uses. The transfer aid is height adjustable, which allows it to be installed anywhere and also makes it easy to transport. 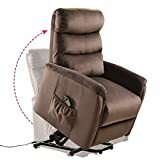 It also offers an ergonomic grip for safe and secure standing, sitting or transferring a patient to a wheelchair, walker or other mobility aid device. When it comes to being elderly, there is so much to look back on in your life. Most likely, at this moment in time, you have built a great experience and worked to earn the independence that you enjoy. 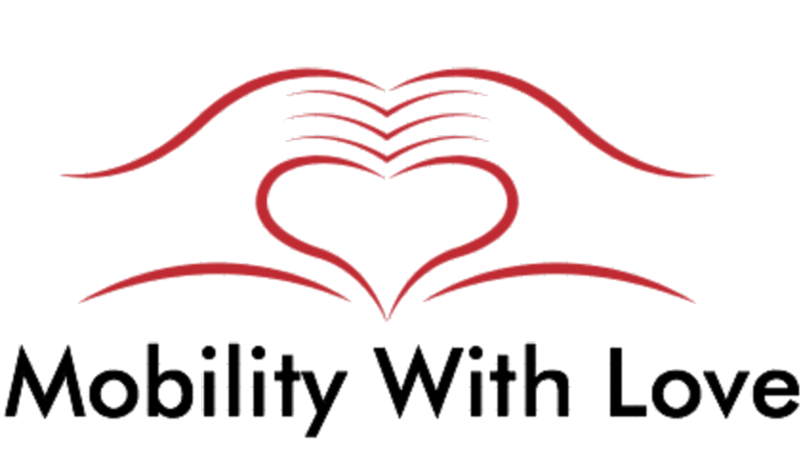 However, mobility issues can take your hard-earned independence and make your life difficult and risky to live without a person by your side. Choosing the best transfer pole for elderly such as Signature Life Sure Stand Pole, enables you to get your freedom back by helping you stand up anywhere without drilling holes. The security pole features a tension-mounted design that allows you to install it at any place in your home from a bathroom, bedroom to living room. It offers the much-needed support that enables you to stand safely without interfering with the feel and look of your home. If you are looking for the best transfer pole for elderly that install securely without leaving holes or marks, then HealthCraft SuperPole is a great option. The security pole features a SuperPole with a super bar that creates unmatched reliability and sturdiness by expanding between the ceiling and floor. It also includes rubber pads that prevent markings on the ceiling and floor and even stipple ceiling. HealthCraft Superpole Security Aid features an ergonomic design that suits all the needs of a senior, thus reducing caregiver’s strain by promoting independence and safe movement. 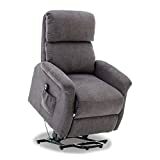 It is also compact, which allows it to be installed in places with limited space, where other mobility devices such as a walker, or wheelchair cannot manage to access. This product is another security pole from HealthCraft that offers many benefits to seniors with mobility issues. It features an award-winning modular support system known as SuperPole System. The system is specially designed for people that require assistance with transferring, moving in bed or standing making it one of the best transfer poles for the elderly. Besides, the system includes a trendy floor-to-ceiling grab bar, which offers a secure structure and can be effortlessly installed between the ceiling and floor. Apart from being easy to install, the security pole is also easy to relocate as it installs by turning the screw at the bottom of the pole. It also comes with rubber pads at the floor and ceiling plates to prevent marring of the surfaces and also holds it securely. Healthcraft also offers a super pole with a trapeze together. As mentioned above, a security pole comes handy in ensuring that you can lead a safe and independent life even if you suffer from mobility issues. Finding the best transfer pole for the elderly can be a considerable challenge, but we believe that the products that we have reviewed here will enable you to get the right transfer aid. Besides, we have also provided detailed information that will help you find other top rated floor-to-ceiling transfer poles if you do not like the ones on our list.